Gorgeous piece of artwork from Star Wars! Han Solo sits alone aboard the Millennium Falcon and reflects. Paper giclee is a limited edition of 95 pieces! Star Wars fans are not going to want to miss out on this amazing piece of artwork from the Star Wars universe! 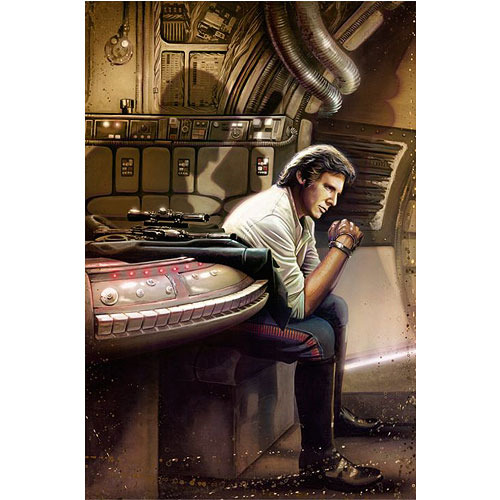 Featuring a rare intimate moment of Han Solo, Captain of the Millennium Falcon, sitting alone aboard his ship and contemplating his past, present, and future, this beautiful giclee has been printed on paper, and is entitled "Redemption." Cool on the outside, but a waterfall of emotions on the inside, Han Solo is seen here sitting forward, worried, resting his elbows on his knees - his shadow behind him casting the form of a man holding a blaster pistol - and he knows that he must choose between either repaying his debt to gangster Jabba the Hutt to save his own life, or risking his life against the Galactic Empire to help the people who care about him. A limited edition of 95 pieces, this gorgeous piece of artwork measures 19-inches tall x 13-inches wide.